Join us for this unique Off-Broadway performance. February, 14, 7.30 pm, Saint Marks Theater 80! This production tells of the tragic love story between Demon, a fallen angel, and Tamara, a Georgian princess. The performance blends music, poetry and the projection of images featuring the works of Russian painters. DEMON is a co-production with New Opera NYC and Rustem Galitch Poetry Theater. 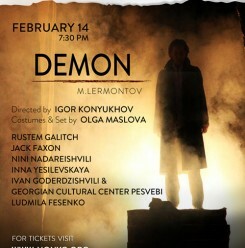 The presentation features Rustem Galitch as narrator and in the role of Demon. This multimedia production is based on the poem by Mikhail Lermontov and combines Georgian music and Georgian dancers Pesvebi, as well as operatic interludes. This performance in Russian will be enhanced with subtitles in English for American audience.